Guilford Graham Hartley was a man of varied business interests. He invested in just about every growing industry active in northern Minnesota in the late nineteenth and early twentieth centuries, from logging camps to iron mines, real estate to street railways, newspapers to wholesale food and dry goods, vaudeville theatre to shoe manufacturing, and cattle ranching to vegetable farming. In the early 1900s his 780-acre Allandale Farm, then the largest agricultural facility within the Duluth city limits, became famous as the producer of the highest quality head lettuce and celery in the nation. 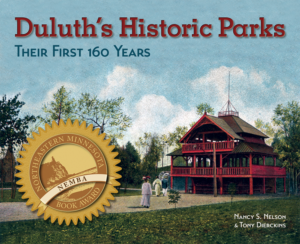 Today Hartley Park—as well as nearby Woodland Park—serves as a reminder of Hartley’s influence during Duluth’s boom times. When Guilford Hartley arrived in Duluth in 1885, he already had a strong interest in farming. As the Duluth News Tribune later wrote, “He knew instinctively that wealth is in the soil.” Hartley believed that northeastern Minnesota had great potential for agriculture, and in January 1890 he spent $15,000 to purchase the first eighty acres of what would become Woodland’s Allandale Farm. This parcel was bounded on the north by Anoka Street, on the east by Allendale Avenue, on the south by the extension of Fairmont Street, and on the west by the extension of Rendle Avenue. Woodland Avenue cut through the northeastern corner of the property. A month later, Hartley and about twenty other real estate investors—many of whom owned land along Woodland Avenue—created the Motor Line Improvement Company. Their goal was to buy and sell real estate and to construct streetcar lines and other means of transportation that would facilitate development of the Woodland area. By November 1890 the company had completed the first Woodland Avenue streetcar line, which split off from the existing East Fourth Street line. After the Woodland line was completed, operation was turned over to the Duluth Street Railway Company. Hartley planned to use the new streetcar line for shipping produce from his farm, and once the line was in place, he hired laborers to work year-round clearing the land, much of which was wet, mucky, and covered by thick brush. By 1892 workers had cleared fifty acres on the west side of Woodland Avenue. Hartley established a dairy, which was operated from 1894 to 1895 by tenants John and Sarah Berry before James Keough and Daniel Ryan took control. The News Tribune referred to the Keough & Ryan Dairy on the Hartley farm as “a body of fine rolling grazing land, traversed by a clear creek fed by springs of the purest water.” The dairy barn was located near Tischer Creek, not far from today’s Hartley Nature Center. The farm was well known for its clear spring water. At a time when people in some parts of the city suffered from typhoid fever, those who got their drinking water from the Hartley Springs claimed to be free of sickness. Several springs were located on the farm, including one at the base of the massive rock outcrop on the east side of Woodland Avenue, south of Anoka Street. According to the News Tribune, “it would be impossible to find a spring located in any better manner to avoid pollution either by accident or design, and the crystal purity of the water is delightful.” This spring was fitted with a pump, and the Keough & Ryan Dairy furnished their customers with several hundred gallons of pure spring water daily. Mr. Hartley has reserved this…so that no one can ever put up a building or maintain anything that might become a possible source of contamination to the adjacent spring…. In the springtime a quantity of sap is procured from the grown maples and really pure maple syrup is not altogether unknown in Woodland. Mr. Hartley had a conviction that mucky, soggy, tree-bound swamp lands ought to be good for head lettuce and celery. So he went to work. He cleared, ditched, drained, and fertilized a piece of muck land and planted it to head lettuce. It grew 30,000 heads to the acre, with two crops a season, making a gross return of about $3,000 an acre on land that was bog the previous season. 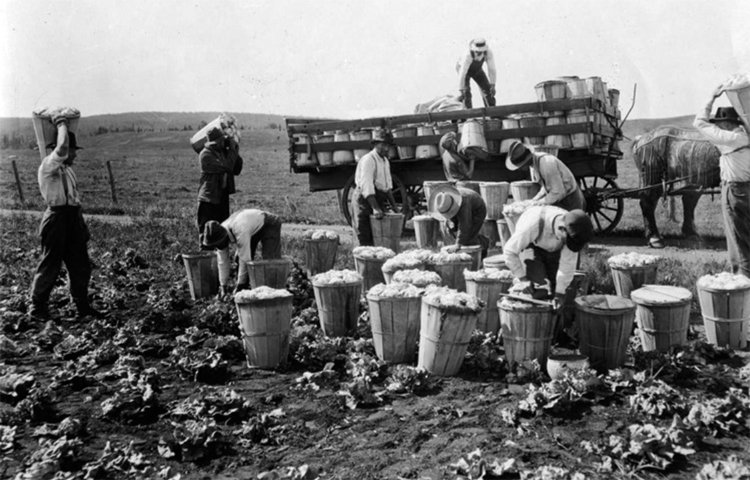 Mr. Hartley had a gross income of more than $9,000 from three acres of lettuce, shipping to Chicago after the Duluth market was supplied, and the quality of his product caused such a sensation among lettuce-growers throughout the middle west that some of the most successful of them, after visiting Duluth, announced their intention of buying farms in the vicinity. In 1913 he dammed Tischer Creek to create a pond. A farm house went up in 1919, the same year a large root cellar was installed east of the massive outcrop known as Rock Knob. Although Hartley was always actively involved in running the farm, it was a long way from his home along Chester Creek at Thirteenth Avenue East and Superior Street where the family continued to live. Most of the farm work was done by hired laborers, although the family visited the farm frequently. According to Allandale Farm researcher Robert J. Slabodnik, “the Hartley family enjoyed the farm and forest land in their log cabin (called Rabbit Camp) as a place to escape the city.” The Hartley’s seemingly idyllic way of life, however, would not last forever. Guilford Hartley died in his home in 1922 after being taken suddenly ill while attending a concert at the First Methodist Church. According to his obituary, he had been in poor health for two and a half years following a struggle with influenza. By this time the Hartley children were grown and busy with their own lives. Within two years of Hartley’s death, operations at the farm and dairy had come to a halt. By then refrigerated train cars could ship produce cheaply across the country, and the increased competition along with a steep hike in property taxes meant the end of the Allandale Farm. In 1929 the Hartley family donated to the city a ten-acre tract of the property located on the east side of Woodland Avenue where Hartley had once tapped his maple trees. The family requested that the area be used for a recreational field. The News Tribune editorial board wrote, “The gift of this fine tract by the Hartleys is a generous act… It will stand as a permanent memorial to its donors, and will be appreciated by Duluth people.” The city designated the area Hartley Field, and between 1930 and 1931 the park department oversaw the construction of a football field, baseball diamond, and tennis court at the site. National Youth Administration Projects in 1940 included the development of a children’s play area, landscaping, and the construction of fireplaces, picnic tables, horseshoe courts, a baseball diamond, and sand boxes. Today that ten-acre tract, known as Woodland Park, is the home of Fryberger Arena, the Woodland Community Club, the John Baggs Memorial Field (Duluth Eastern Little League), the Tony Emanuel Memorial Field, three tennis courts, and two outdoor hockey rinks. The Hartley family rented out the pasture land west of Woodland Avenue until 1931, the same year they stopped paying taxes on the property. In 1939 the State of Minnesota declared the land tax forfeited and took ownership. The St. Louis County Board, which administers tax-forfeit parcels on behalf of the state, classified the Hartley tract as conservation land, meaning it was set aside for forest management and recreation. In 1941, with help from the Duluth Conservation Club, the City of Duluth acquired about 418 acres of the Hartley tract to use as a public park. The city, however, was short on resources. During the Depression in the 1930s, some work on Duluth’s parks continued under the Works Progress Administration, but the municipal budget was cut dramatically. Those cuts continued during World War II and on into the late 1940s, and all city parks suffered from a lack of maintenance. The park department reported that its budget for 1942 was about equal to its 1932 budget, even though the workload had doubled because of new parks and recreation areas added to the system.